I made this pumpkin bread in a Zojirushi bread machine, but it should work with any standard size bread machine with a cake or quick bread cycle. Mix the ingredients together in a bowl first to make sure they're well combined. Use canned pumpkin puree or homemade. Spray bread machine pan with nonstick cooking spray or baking spray. In a bowl, mix vegetable oil, eggs, pumpkin puree, and sugar together until well blended. Stir in the baking powder, soda, salt, spices, and flour just until mixed. 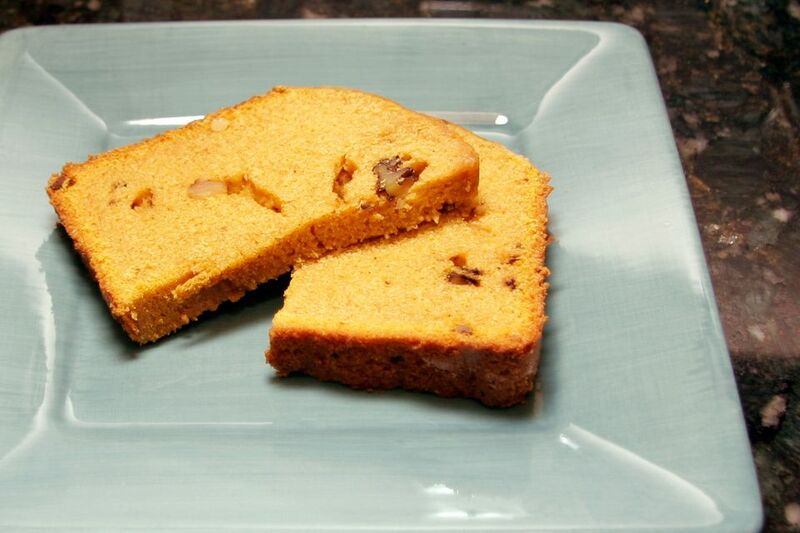 Pour the batter into the prepared bread machine pan and set on the cake or quick bread cycle. Add chopped nuts at the beep, if using. Carefully loosen the loaf from the pan and paddles and turn out onto a rack to cool. If desired, add about 1/2 cup of raisins, dried cranberries, or chocolate chips along with the chopped nuts. Oven Directions: In a mixing bowl, combine all of the ingredients, including the nuts. Bake the bread at 350 F in a greased loaf pan for about 50 to 60 minutes, or until a toothpick inserted into the center comes out clean.